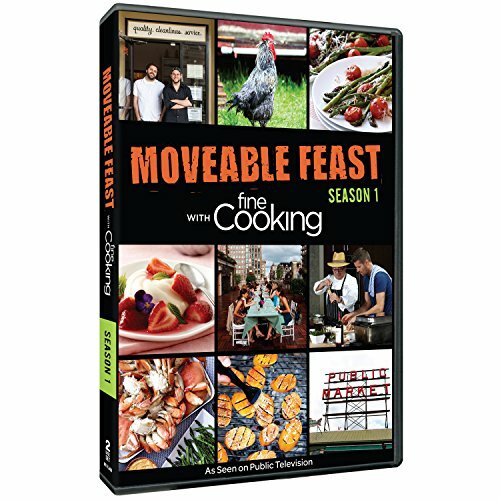 Arlington, Va. - December 5, 2014 - PBS Distribution announced today it is releasing Moveable Feast With Fine Cooking - Season 1 on DVD. From the vibrant seafood-filled waters of Puget Sound to the rich, grape-filled fields of Sonoma, from an intimate sunset dinner on an urban rooftop terrace in Manhattan to a beach banquet for 150 people in the San Francisco Bay Area, the series "Moveable Feast with Fine Cooking" celebrates the spirit of pop-up cooking events and invites the country's most innovative chefs, rising culinary stars and food artisans to partake in a one-of-a-kind gastro adventure that will inspire viewers. Produced by WGBH and Fine Cooking magazine, the 13-episode series crisscrosses the country, teaming up talented chefs with host/chef Pete Evans to create unique and spontaneous feasts in unconventional settings for friends and family. Moveable Feast With Fine Cooking - Season 1 will be available on DVD December 30, 2014. The run time of the program is approximately 390 minutes on 2 discs, and the DVD SRP is $29.99. In each episode, host Pete Evans, one of Australia's top celebrity chefs, author and restaurateur, travels to a new location in the U.S. to challenge local chefs to join him in spur-of-the moment "culinary jams" to create in one day a feast in an exciting location. Culinary guest stars - including renowned chefs Jacques Pepin, Marcus Samuelsson, Anita Lo, Larry and Marc Forgione, Jonathan Waxman, Andy Ricker, Jeffrey Saad, and more - are asked to demonstrate their farm-to-table cooking methods, as viewers follow them to source the finest local ingredients for their dishes. Afterwards, the chefs join forces and work against the clock to prepare a multi-course menu for an eclectic, enthusiastic, and ravenous group of diners. Viewers will learn from the participants firsthand what ingredients inspire their cooking perspective and the local food treasures and experiences that best exemplify their home cities. In the first episode (Seattle: Tom Douglas and Thierry Rautureau), host/chef Pete Evans kicks off the culinary journey in Seattle, where he meets with chefs Tom Douglas and Thierry Rautureau. The chefs take Pete on his first crabbing trip to catch Dungeness crab in Puget Sound. In this episode, the series also visits Seattle's legendary Pike Place Market and culminates with the chefs joining forces to create a delectable meal of squid on garlic toast with arugula, steaming Dungeness crab and pasta ricotta salata (Tom's version of mac & cheese! ), and sand dabs with garlic flowers and morels - in a "pop-up" feast for 15 guests at a beach pavilion overlooking the water. Descriptions of episodes 2-13 are below. San Francisco: Jeffrey Saad and Cortney Burns, Pete Evans travels south to San Francisco to cook a delightful international, spice-themed meal, as the chefs visit Tcho Chocolate Factory and Spice Ace to pick up fresh just-made chocolate and exotic spices such as galangal root. Millstone Farm with Jacques Pepin, Bill Taibe, and Tim LaBant - A farm fresh meal from Millstone Farm's best ingredients includes a delicious meal of eggs in lettuce wraps, slow roasted pork shoulder and baby turnips, greens and fennel fritter salad. The Culinary Institute of America with Marc and Larry Forgione - Pete Evans visits the CIA in picturesque Napa Valley and cooks with three of the area's finest chefs. Corn meal is used to make polenta for that evening's Napa-style feast, and fresh strawberries from CIA's own student garden are roasted with dark chocolate and smoked chili.Westport, MA with Chris Schlesinger and Doc Willoughby - With beautiful views of the Atlantic Ocean, Pete joins Massachusetts grill master and renowned Food Editor Doc Willoughby for his first quahogging adventure to gather up Atlantic hard clams to grill up for that evening's dinner, just as the sun sets over the horizon. Providence, Rhode Island with Matt Jennings and Ken Oringer - Pete Evans cooks with two of the East Coast's best chefs to make a delicious meal on a roof deck in downtown Providence that overlooks the entire downtown area. Dinner includes green asparagus with black truffle vinaigrette and morels, sassafrass panna cotta, and grilled pork belly with razor clams.Outstanding in the Field with Ravi Kapur - Pete Evans joins Chef Kapur in a cooking adventure unlike any other, in which they cook in a "restaurant without walls." With majestic views of the Pacific Ocean as the backdrop, Pete and Ravi cook up a delightful beachfront feast for over 150 guests. The guests are in for a surprise when the tide comes up to wash over their feet during the meal! Seattle with Maria Hines and Holly Smith - Set in the trendy Mallet Kitchen in downtown Seattle, Pete Evans is joined by local chefs Hines and Smith to cook for their excited guests. Side trips include Oxbow Farm and Loki Fish Company to collect fresh seafood and meat. Pete is joined by two legendary New York chefs to highlight diverse local flavors, after they gather fresh ingredients from the Harlem Farmer's Market. Pete also heads down to Brooklyn to gather pickles from the Brooklyn Brine Company. During Pete's trip to Sonoma, CA, he meets up with several culinary artisans to cook brunch for their hungry guests at a picturesque winery. They decide on a delicious breakfast casserole, fig salad and apple balsamic and cheese blintzes to curb hungry appetites. Set inside the beautiful seaside town of Duxbury, MA, this episode features legendary Boston Chef Jeremy Sewall, sustainable cooking expert Barton Seaver, and Island Creek Oysters owner Skip Bennett, whom Pete Evans joins in foraging for oysters for the feast. Pete Evans teams up with two of Sonoma's finest chefs, Estes and Stark, to gather up goat cheese and milk at Redwood Hill Farm and pick up a few ducks for that evening's feast. Coffee BBQ duck and smoked cheddar polenta are just some of the delectable courses featured. Lightner, Lo and Ricker - joining Pete Evans for an al fresco urban feast for 50 people, featuring herbs and spices gathered at Wards Island and Chinatown. The evening unfolds in a hidden jewel of a place: a rooftop terrace with breathtaking sunset views of Midtown Manhattan. WGBH Boston is America's preeminent public broadcaster and the largest producer of PBS content for TV and the Web, including Masterpiece, Antiques Roadshow, Frontline, Nova, American Experience, Arthur, Curious George, and more than a dozen other prime-time, lifestyle, and children's series. WGBH's television channels include WGBH 2, WGBH 44, and the digital channels World and Create. WGBH TV productions focusing on the region's diverse community include Greater Boston, Basic Black, High School Quiz Show, and Neighborhood Kitchens. WGBH Radio serves listeners across New England with 89.7 WGBH, Boston Public Radio; Classical New England; and WCAI, the Cape and Islands NPR(R) Station. WGBH also is a major source of programs for public radio (among them, PRI's The World(R)), a leader in educational multimedia (including PBS LearningMedia(TM), providing the nation's educators with free, curriculum-based digital content to meet the needs of 21st-century learners), and a pioneer in technologies and services that make media accessible to the 36 million Americans who are deaf, hard of hearing, blind, or visually impaired. WGBH has been recognized with hundreds of honors: Emmys, Peabodys, DuPont-Columbia Awards...even two Oscars. Find more information at wgbh.org.